The government introduced National Registration Identity Cards in World War II. Everyone, including children, had to carry an identity (ID) card at all times to show who they were and where they lived. The identity card gave the owner's name and address, including changes of address. Each person was allocated a National Registration number and this was written in the top right hand corner on the inside of the card. The local registration office stamped the card to make it valid. On the back of cards for children and young people under 16 was space for the parent or guardian to sign. The parent or guardian was responsible for looking after the child's identity card, and producing it when required. This card was issued in 1945 to Kathleen Sperring of Thundersley and was valid until 1961. She was probably a baby in 1945 and the card was valid until she was 16, when she would have had to collect a new card at the local National Registration Office. The Identity Card Holder is black and has its name on the front along with 'National Registration Act 1939.' The identity card slotted inside, and the holder protected it from wear and tear. During World War II the government kept a central register of everyone in Britain. Names, date of birth and address were listed in this national register. It held the information needed for issuing national identity cards and food and clothing ration books, and for identifying children eligible for evacuation and adults eligible for call-up into the armed forces. Identification was necessary if families got separated from one another or their house was bombed, and if people were injured or killed. The sections in the card showing the change in address were important, as many people moved several times during the war. If a family's house was bombed, they moved in with relatives, or moved to a different area. Just under half of all London schoolchildren were evacuated, travelling to places that were not so badly affected by air raids and bombing. The identity cards were a way of keeping track of the children's movements and ensuring that they could be reunited with their families when they returned to London. The police, army and Home Guard checked identity cards for security reasons. It was believed that this helped in the detection of foreign spies and Nazi paratroopers. But there was never a case of an enemy spy being discovered for lack of an identity card. The government used the information to 'call up' men for service in the army, navy or air force. Since the register had a record of dates of birth, it was able to identify men who had reached 18, the age when men were eligible for active service. The government then sent 'call up' papers to the person, telling them where they should report for service. People had to produce their identity card alongside their ration book to prove that they were entitled to their share of food or clothes. This stopped black market trading in loose rations or people using the coupons that belonged to someone else. The shopkeeper made sure that the correct person was claiming the food by checking that the cards and ration books matched. 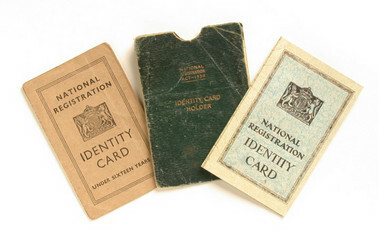 In 1943 registration and rationing were combined and a fresh set of identity cards were issued at the same time as the new ration books. Always carry your Identity Card. You must produce it on demand by a police officer in uniform or member of HM Armed Forces in uniform on duty. You are responsible for this Card, and must not part with it to any other person. You must report at once to the local National Registration Office if it is lost, destroyed, damaged or defaced. If you find a lost Identity Card or have in your possession a Card not belonging to yourself or anyone in your charge you must hand it in at once at a Police Station or National Registration Office. Any breach of these requirements is an offence punishable by a fine, imprisonment or both. The British wartime identity card scheme was abolished in 1952, but another use was found for the registration numbers. When the National Health Service (NHS) was set up in 1948, the National Registration Numbers were used for patients' records. Each person's National Registration number became his or her patient record number. And so the register became the Central Register for the NHS for England and Wales. It is based at Southport and keeps patient records and up to date lists of patients in each Health Authority. ID cards are common in countries in the European Union. People who live in France, Germany, Belgium, Portugal and the Netherlands all have national ID cards. The cards are used to access government services e.g. health services. The cards can be used to cross borders to visit other countries in the European Union, instead of a passport. An attack by enemy aircraft in which bombs are dropped. There were air raids on the British population in WWII. To summon for active military service. A part-time military force of volunteers recruited to defend Britain in WWII. The unique identifying number for each person in Britain.